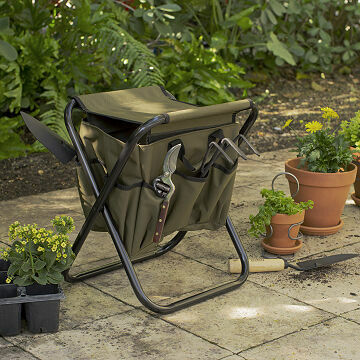 This lightweight steel and nylon garden stool combines the features of a tool bag and a folding chair. Wipe with a damp cloth and air dry. Please note: we have improved this product as of March 2013 with stronger reinforced webbing to better support up to 250 lb. capacity. Fabric seat measures 10.5" W.
Got this for my dads birthday and he loved it! It's the perfect height for gardening. It'll make it easier on my dads back so he doesn't need to bend over to tend to his plants. It's super handy to have the pockets for tools! I can't wait to hear how much she likes it! I am hoping she enjoys this gift and I made a good choice. My mom uses this while tensing to her garden beds. She loves that it carries her tools and reduces the amount of bending while weeding. My mother, the gardening extraordinaire, can plant again! My mother had a knee replacement this past year and believed that gardening was no longer an option for her. She couldn't bend down to get to her plant beds and was tearful that she could no longer grow her favorite fruits and veggies anymore. I got her the tool seat for her birthday and now she doesn't have to worry about bending over. The tool seat is just high enough that she can sit comfortably in front of her planters (they are on the ground) without hurting her knee or feeling like she is squatting. It is low enough that she can reach her plants while sitting. The tool belt around the seat is helpful when she needs to grab a trowel or shears as they are right there. I would buy this again just to see my mom happy. If the seat was bigger and it was lower it would have been perfect for my mom. The was bought for my dad who is a master gardener and had recent knee surgery. He was telling me that he was having a hard time getting down to play in his gardens. Perfect for saving my back whileh gardening! Has room for lots of tools, sturdy, tough fabric, good color. Great lightweight seat to use gardening/outside work! I gave one to my sister who is a Master Gardener in Loudoun County VA - she loved it. I got this for my mom for Christmas. She absolutely loves it. She's amazed with how many with how many pockets and space it has. And the height is perfect.